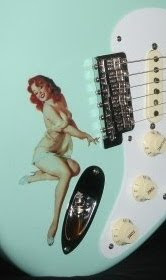 This is from an early Fender Custom Shop 500 piece run from '88-89. You're looking at the HLE (Homer/Haynes Aztec Gold Limited Edition) '57 RI #421. The Music Gallery of Chicago currently lists this one complete with OHSC and COA. The COA is the early style signed by Bruce Bolen, and the FCS headstock back logo is the oval type with the run series #'s. Homer Haynes of Homer & Jethro fame owned a custom Aztec Gold Strat that the run was designed from. Features/Specs include soft "V" neck with 7.25" radius, vintage size frets, 3-way switch, anodized pickguard and gold hardware. Not minty or NOS, there are some dings and fretwear present. Close-up photos are included in the listing. We've featured these in past posts.